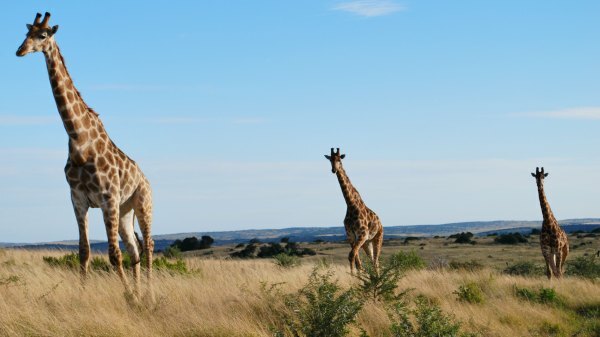 Going on safari in South Africa was one of the most memorable experiences we’ve ever had. If you want to get up-close and personal with all kinds of African animals in their natural habitat, then you’ll love it too! Beware though, not all safaris are the same. 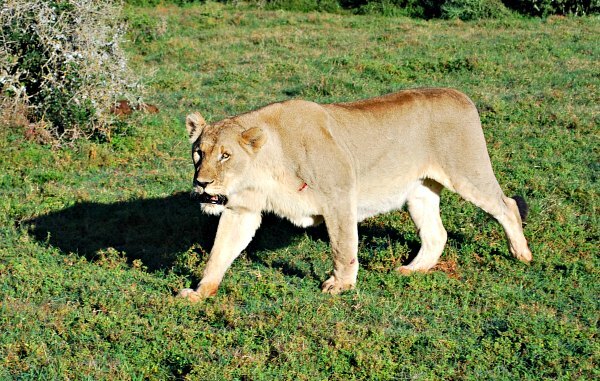 There are plenty of places that offer the safari experience within driving distance of Cape Town/Durban, but some some don’t have all the animals you’d expect and others feed them, so they’re not wild and it’s more like a zoo. After much research, we settled on a private game reserve which has luxury accommodation, loads of animal species and all-inclusive “game drives” with experienced rangers. Shamwari Game Reserve, which is about 25,000 hectares in size, was absolutely fantastic and we’d recommend it to anyone. 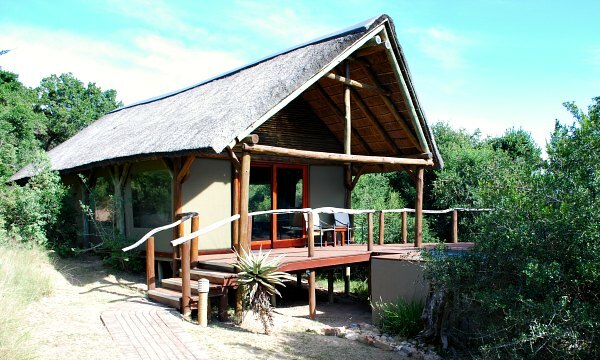 There are several ‘lodges’ at Shamwari with different kinds of accommodation. We chose the Bayethe lodge which is described as ‘tented accommodation’. Don’t expect a glorified camping experience though – this is proper 5 star luxury. Each tented lodge (pictured above) has an attractive living and sleeping area, a dressing area, a bathroom with roll top bath and a toilet. The lodges only have canvas sides and windows, everything else is a permanent log-cabin style structure. They’re air conditioned, or heated, depending on the time of year. You also get your own plunge pool/spa and sun loungers. 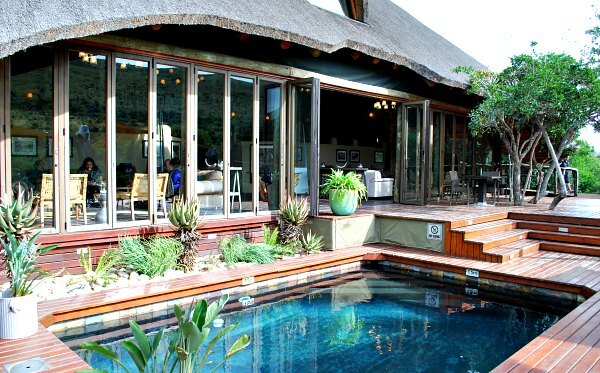 The lodges are all grouped along a watering hole within the game reserve and so you can expect to see the wildlife from the camp. There are however, small fences which stop anything getting too close to the lodges themselves. Accommodation is all-inclusive (except drinks) and you can expect very good food, cooked to order and terrific service. The big draw of a safari though is the animals and at Shamwari you can expect to see a wide variety on your ‘game drives’. The drives go out just after sunrise and just before sunset, so times vary throughout the year. You’ll get an alarm call to wake you up in time! They typically last around 3 hours each and the time absolutely flies by. We got the impression that a lot depends on how good your ranger is because the animals aren’t just hanging around waiting for tourists, they’re behaving naturally and have to be sought out by the rangers. Our ranger, Jacques, was excellent and found lions, cheetahs, rhinos and and elephants without the help of the other rangers out at the same time. In 25,000 hectares of space, there are no guarantees, but all the rangers talk to each other on radios to pass on their finds to the others. Over our 3 days, we managed to see the ‘Big 5’ safari animals, but many people don’t. One thing that amazed us is how these wild animals just ignore a safari car full of tourists. It’s like they don’t really see them and so they behave normally even if you’re right next to them. 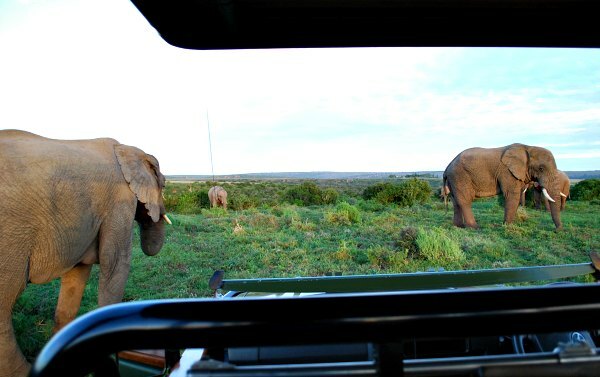 Our ranger parked right in the path of a herd of 25 elephants and they proceeded to just walk right around us. You’re not allowed to touch the animals on the game drives but they were almost close enough to do that. One tiny elephant was less than a week old and it was an incredible experience. We also saw lions hunting and consuming a ‘kill’, hippos sleeping by the river at sunset and a leopard just sauntering along in front of our car. This map shows the location of Shamwari, but the reserve covers a vast area. Shamwari is accessed via the N2 motorway, but directions vary depending on which lodge you’re staying at and where you’re coming from. The nearest large airport is Port Elizabeth, which you can fly to from all over South Africa. You can then arranged an hour-long car transfer from the airport to Shamwari with a reputable company.